A new three-year partnership agreement between North Highland College UHI and Nigg Skills Academy has been signed to deliver engineering skills and qualifications to the Ross-Shire area at their academy in Nigg. Nigg Skills Academy works with employers and industry bodies to deliver engineering skills to meet today's industry demands, has established a memorandum of understanding with North Highland College UHI to continue to provide opportunities for those seeking careers within the engineering and energy industry. Donald MacBeath, Principal of North Highland College UHI added, "The College is delighted to be able to extend its engineering provision in this part of the North Highland area. This partnership combines the resources and respective strengths of Nigg Skills Academy and North Highland College UHI to create and develop new skills opportunities moving forward." Commenting on the partnership agreement, Alistair Kennedy, Nigg Skills Academy's Chairman, said: "We are delighted to have entered into this three-year agreement with North Highland College UHI and thanks to Donald and his team for their support in forming this exclusive partnership working agreement. This agreement will see us providing a great opportunity for those wishing to get into engineering and the energy business." Alistair continued, "We had our first cohort of 21 students starting last week and they will be with us for the 16-week course where they will come away with their SVQ level 2 in Performing Engineering Operations, as well as a National Certificate in Fabrication and Welding. 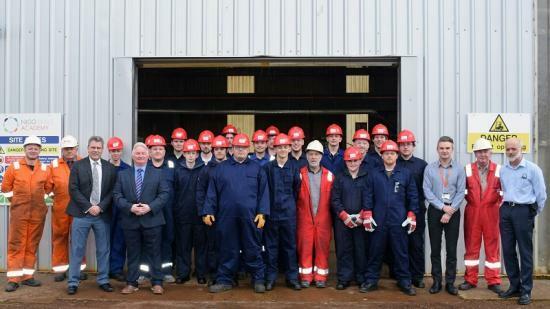 Employers and industry are looking for more industry-based training and this is exactly what we provide within our training facilities at Nigg Energy Park." The College also delivers the SVQ Level 2 in Performing Engineering Operations with National Certificate in Fabrication and Welding at its Engineering, Technology and Energy Centre in Thurso. The North Highland College UHI is one of 13 Colleges and research institutes that make up the University of the Highlands and Islands. In the photo front row far left is Donald MacBeath, Principal of North Highland College UHI andsnext to him is Alistair Kennedy, Nigg Skills Academy's Chairman.